gloryfy unbreakable lenses have a very special contrast effect due to mass colouration. This colour-fastness technology is responsible for trapping the colours permanently in the material, so the colours remain deep and vibrant for all time. Conventional lenses are simply dipped in colour baths, therefore only the surface of the lens is coloured. Another advantage is that possible scratches can barely be seen as the material always has the same colour at every point in the mass. Due to the high flexibility of the frame and of the gloryfy lenses, the lenses in the models in the SPORT collection can be very easily changed. gloryfy transformer lenses made of NBFX guarantee a perfect adaptation of the tinting to different light conditions from light to dark (55-88%) in the filter stages F1 to F4. Ensures optimal ventilation in order to prevent misting-up of the lenses during strong perspiration. At the same time, a redirection of the air flow by 90 degrees prevents draughts directly onto the eyes from occurring. The light reflected from strongly mirrored surfaces is perceived by the human eye as unpleasant dazzling. The NBFX polarisation lenses eliminate these reflected light waves effectively. UV protection is guaranteed with all gloryfy NBFX lenses by the material used, which protects the eye 100% against UV rays (280 to 400nm) and, depending on the lens colour, also against dangerous blue light. Blue light, also called „high-energy visible light“ (HEV), is the visible portion of light with the highest energy. If the eyes are exposed to blue light for a prolonged period, besides the irritating dazzle effect there is also a danger of causing serious damage to the retina. 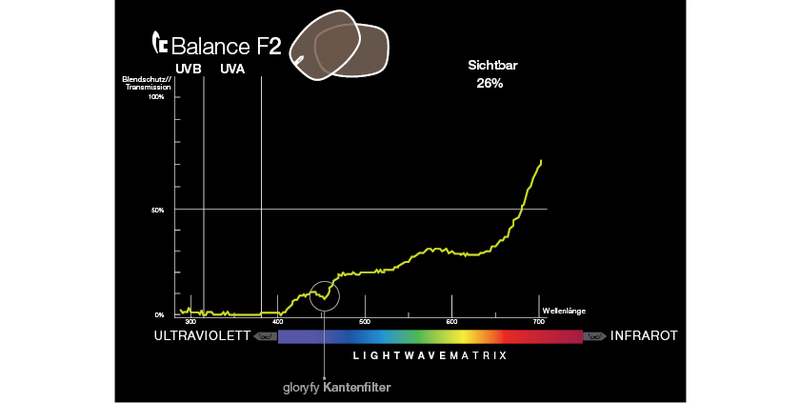 Special NBFX lenses filter out this portion of the spectrum, particularly the orange, red-brown and olive lenses. 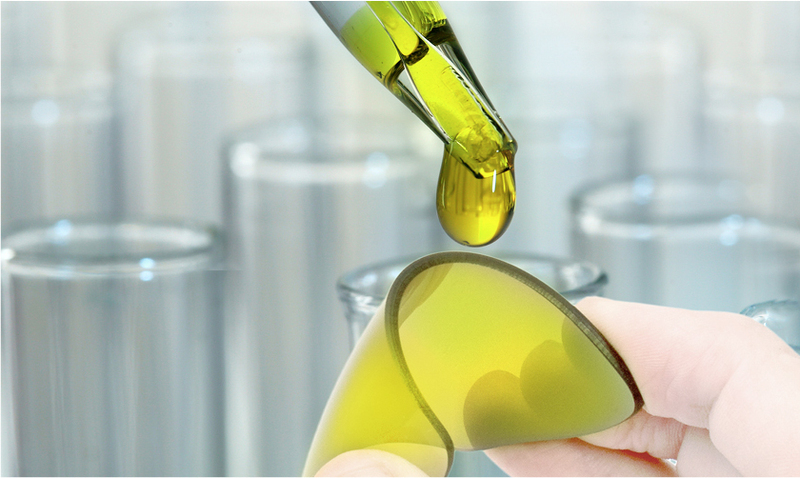 The reason for the high optical clarity of the lens material is the high Abbe number of NBFX (Abbe number 45) in comparison to polycarbonate (Abbe number 31) and 1.67 material (Abbe number 32). Caused by the curvature in the lense. As a result of the high-end gloryfy NBFX material and the decentration, gloryfy lenses are classified in the highest optical quality category. Application of prismatic correction with different gloryfy base curves: Base 5 very slight prismatic distortion, base 7 prismatic distortion also present, base 9 strong prismatic distortion! The refractive index of NBFX™ is 1.53. Combined with the relatively ?thin glass thickness, which is possible due to the exceptional material ?properties of NBFX™, values can be produced up to minus 4 and plus 3.
gloryfy NBFX STRATOS lenses guarantee uncompromising precision and clarity of vision. Stratos lenses perform best on clear sunny days, blue light is not filtered which means far more available energy for athletes and therefore top performance. The gloryfy PCCM technology turns your eyes into eagle eyes. 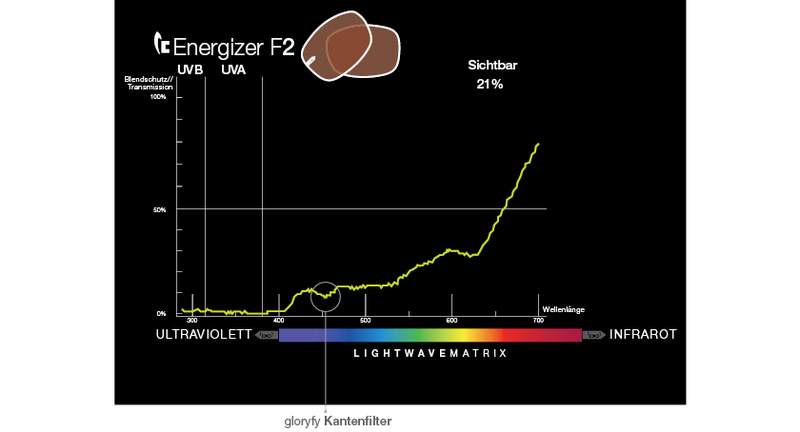 gloryfy NBFX ENERGIZER lenses are a miracle of optical technology. The cut-off filter creates contrasts where there don’t appear to be any! They are ideal for days outdoors with poor visibility or diffuse light and restore energy to the body. Clear vision is guaranteed, reaction times are improved. gloryfy NBFX ENERGIZER lenses produce their best performance (maximum contrast enhancement and colour performance) in bright weather, heavily overcast skies and even in extreme fog conditions. Natural light is radiated in all directions in waves. The light that bounces off highly reflective surfaces (snow, water, beach, traffic) is polarised, that is to say the light is aligned in one direction, which the human eye perceives as an unpleasant glare. The NBFX TRIPOL-Lenses effectively eliminate reflected light waves. The gloryfy NBFX TRIPOL-Lenses use a filter foil that is optimised to give a perfect POL effect while still allowing modern, digital displays to be read. The transformer lenses adjust perfectly to the light condition. Whether it’s light or dark, perfect vision is guaranteed. gloryfy NBFX TRANSFORMER lenses guarantee the perfect adjustment of tinting to different light conditions from light to dark (55 - 96%) in filters F1 to F4. gloryfy NBFX BALANCE lenses have a slight edge filter (this filters blue light) and therefore guarantees really wonderful contrasts. The brown shade of the gloryfy NBFX BALANCE lens on the other hand ensures extremely positive and even colour coverage and therefore a balanced mood in line with colour theory. gloryfy NBFX FOGLESS lenses are designed for light conditions such as light fog and an overcast sky! 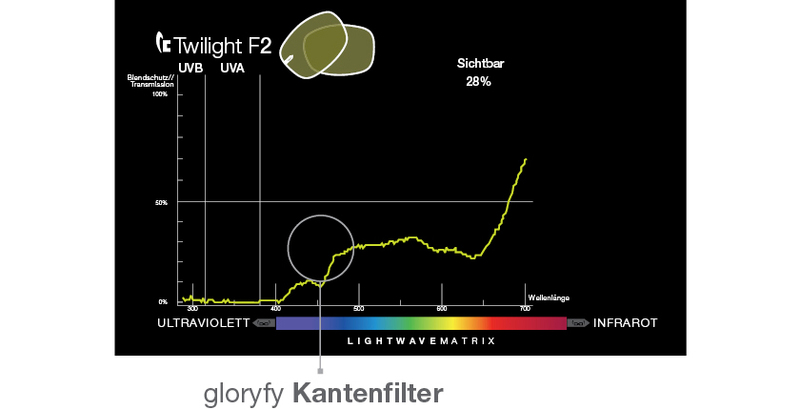 The gloryfy NBFX NIGHTFLIGHT technology offers high transmission with light cut-off filter and creates the best visibility for any night activities (e.g. going on ski tours at night). Dawn and dusk can often mean unpleasant light conditions, especially for sport. The gloryfy NBFX TWILIGHT lenses ensure top performance with cut-off filter, good transmission value and olive tinting. The green gloryfy NBFX RECOVER lenses ensure your body recovers quickly from pushing itself to the extreme thanks to chromatics. The Lightwave matrix also shows that the gloryfy NBFX RECOVER lens lets plenty of light through, which is very important for a quick recovery. The slightly offset cut-off filter guarantees high precision and clear vision.